These days, more students and teachers report being happy at Spring ISD's Bammel Middle School, and the number of three-day out-of-school suspensions dropped from 94 last school year to 47. Principal La'Quesha Grigsby attributes the improvement to a simple schedule change at the beginning of this academic year: a carve-out of 35 minutes twice a week for teachers and students to circle up and talk about their feelings. Bammel Middle School is one of a growing number of Texas schools that have adopted "restorative justice," which encourages students and teachers to talk through their problems and build stronger relationships in order to prevent conflict and violence before it happens. "Sometimes those behaviors we see as discipline problems really are because the student is struggling with their academics," Grigsby said. "We're in a situation where we have to do something drastic ... because what we've been doing is not working." Ed White Middle School in San Antonio's North East ISD was the first in Texas to pilot restorative justice in 2012, when it had some of the district's highest suspension numbers. In just a couple of years, reports showed that, despite teachers' initial hesitance to try a different approach to discipline, the school had higher attendance rates and less bullying among students. When done correctly, restorative justice can change a school's culture, building trust and deepening the relationships students have with teachers, administrators and one another, said Marilyn Armour, director of the University of Texas at Austin's Institute for Restorative Justice and Restorative Dialogue, which trained Ed White educators and partnered with the TEA on statewide trainings. "It's not an approach that's focused on the bad kids." But Armour and other experts worry that as restorative justice spreads, some school administrators will adopt it as a quick fix to improve their suspension numbers instead of taking the needed time — often years — to convince teachers and students to buy into a cultural change. When done poorly, "it's going to go belly up," Armour said. "You could talk to me"
Teachers can't succeed without a "mind shift in approaching and managing student behavior," said Ecomet Burley, director of the Center for Safe and Secure Schools at HCDE. Instead of thinking about when to send a student to the principal, teachers have to think, "How can I get kids to understand their behavior in a way that they decide to change it?" Burley said. 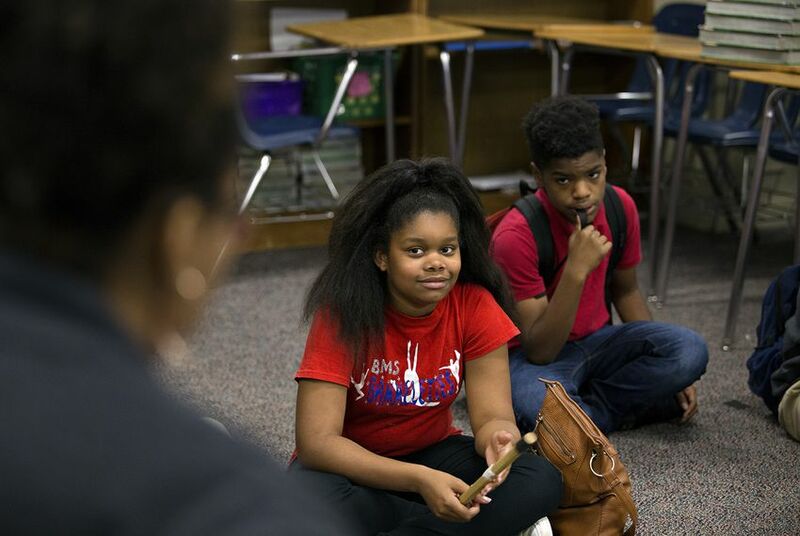 In late April, Bammel social studies teacher Antondria Davis passed the wooden "talking piece" around the circle, prompting each of her sixth-grade students to participate in a conversation about how they should best engage with social media. "Nobody can pass. Everyone has to give some kind of input," she warned, starting counterclockwise. "Don't post inappropriate stuff," 12-year-old Life Ford said, before handing the talking piece to the boy sitting next to her. Forced to express her feelings twice a week to classmates she didn't know well, Ford said the circles helped her communicate better outside of the classroom. When she noticed her best friend seemed depressed at school, Ford pulled her aside and offered to be her sounding board. "I told her, 'You could talk to me about it,'" Ford said. Her friend didn't feel like talking, but Ford felt she appreciated the offer of emotional support. As Grigsby checked in on Davis' class, she joined the circle, sitting cross-legged between two students. "Be mindful of how other people will take what you post," she said, in response to the prompt, as other students shared the missteps they had seen on social media sites. Grigsby didn't get much resistance from staff to the new schedule at the beginning of the year. Frequent fights and outbursts in the hallways and classrooms had created the impression that students were previously "running the school." This year, out-of-school suspensions decreased by about half, though student enrollment also decreased by a few hundred. Students who act out are still sent to in-school suspension, where they talk through their problems in restorative circles and come up with ideas on how to repair the harm. Grigsby wants to build on the community circles next year by adding "academic circles" where teachers can gather students in small groups to introduce a new concept or to hold discussions about a book or movie. "Thank you for letting me be a part of the circle," Grigsby said to the sixth-graders before hopping up and heading to another classroom. At YES Prep Northbrook High School, which is finishing its third year of implementing restorative practices, students play a larger role. They can take a "leadership" class that teaches them how to resolve fights between other students or even teachers. "Everything we do is embedded with circles," said Anita Wadhwa, the school's restorative justice specialist, who is writing a book on restorative justice case studies. She knows it's working because she has almost universal support from teachers, students and families. Teachers circle up with a talking piece for professional development exercises or just to get to know each other better. When students fight, or when teachers fight, they form a "healing circle" with a mediator to talk through the root of the conflict. YES Prep Northbrook High School junior Kasy Aviles was tapped as a student leader last year, along with a small group of sophomores. This year, she led a restorative circle with her English teacher, who was feeling overwhelmed working toward a master's degree in education while teaching sophomores and juniors full time. Aviles expected the usual platitudes when she asked her teacher how she was. Instead, the teacher admitted, "'To be honest with you, I'm not that good,'" Aviles recalled. Nervously, Aviles asked her teacher if she wanted to open up. "She was like, 'Actually, yeah.' She was very open about how she felt," Aviles said. "I was just like, 'OK, is there anything we can do to make your time less frustrating or less hard?' She was like, 'Honestly, just do your work. That's all I ask.'" Aviles realized that her teacher, just like her classmates, was doing homework late at night and feeling sad when her effort wasn't recognized. "I never thought a teacher could express themselves like that," Aviles said. "I tried to tell my friends, 'Hey, take it easy with that teacher.'" "It feels like the first year, because there's a whole new group of teachers we're working with and a new administrator," he said. "But the kids are still here, and I still have those relationships. They make a big difference." Last year, the second year of restorative justice at Jones Elementary School, Hinton was happy to be making progress. He estimated that 90 percent of teachers willingly used circles for discipline or conversations in their classrooms. During a parent orientation just before Thanksgiving, fifth-graders sat in circles with their families and led them in discussion about what they were thankful for. "Parents continue to tell me that they could not believe their kids were talking like that and leading the circles," he said. "They couldn't believe how comfortable they were." Now, just three or four teachers understand Hinton's mission. The majority, those new to the school, have no idea what restorative justice is. Hinton plans to keep training anyone who seems receptive. "This is the way we ought to be living," he said. "We're accountable to each other and how we treat each other. Even if we don't agree, we should still be able to come together and hear each other."